Stamford Urban Group manages to achieve much through the efforts of its Chairman Don Lambert, Secretary David Taylor, and working members Graddon Rowlands, Peter Heyes, Tim Rimmer, Paul Rose and Giles Hopkinson. anyone could remember. The lights were green with mould, one was leaning over and one was not working at all. The poles they were mounted on were mouldy too and needed sandblasting and repainting. As the lights were mounted on an icon of the town, at the entrance to the main shopping area, and part of an impressive view of St Mary’s Church, we felt it was a worthwhile project. Cllr Brailsford agreed to help us with funding and liaising with Lincolnshire County Council’s Lighting Department. We arranged a meeting with Mr Stan Hall and Mr Gary Ferreday, and although they did not have the funding for the lights, they agreed to sort out the road closures, fitting of the lights, and painting of the columns, if we raised the funding. 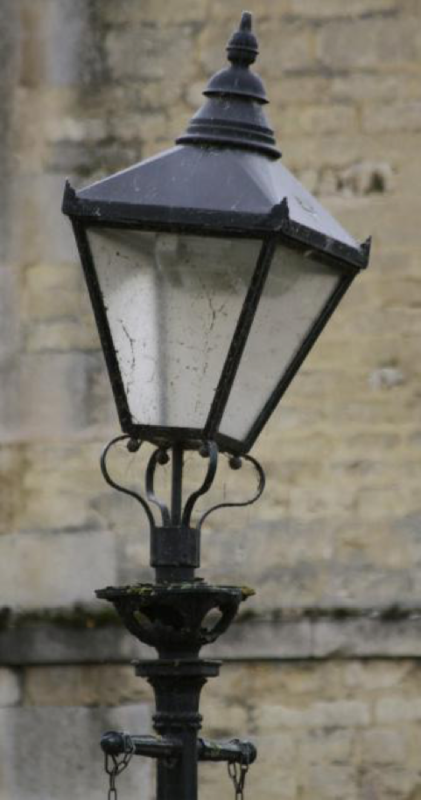 Starting with a sum of £1,050 from a fund controlled by Cllr Brailsford, further sponsorship from Stamford Civic Society, the Urban Group, and the Skells Trust (Stamford Town Council) the sum of £3,800 was raised to pay for the lights. The new lights are to be fitted later in the year. We would like to thank all the groups, and especially Cllr Brailsford, who kindly helped us improve the Town Bridge. Our thanks also to LCC for agreeing to take on the fitting and painting of the lights. improvement of the area. The general aims are to make the area more visitor and user friendly, improve access by widening the path, make the area easier to maintain, completely renovate the seating, prune one of the trees, and replace the street light with a new light. The Urban Group, through Graddon Rowlands and Peter Heyes, gave a presentation on the proposed improvements to St Michael’s Churchyard to the Skells Trust at the Town Hall. All proposals were agreed upon, and funding for the project will come from the Skells Trust, the Civic Society and the generous gift of a local resident. 3. We are working in conjunction with the Town Council’s Strategic Development group on a revamp of the three Gothic arches - part of the Castle’s Great Hall - near Bath Row. We have arranged meetings with the owners, and with an Historic England coordinator, a surveyor, and local councillors, to work on a plan to repair and renovate that area. An ongoing plan of action has been set up, and we hope to have some more information from the surveyor in due course. 4. The Urban Group, in conjunction with Stamford Civic Society and the Town Council, will also be looking at ongoing general maintenance of various green areas of the town, such as Wharf Road and the Bus Station.